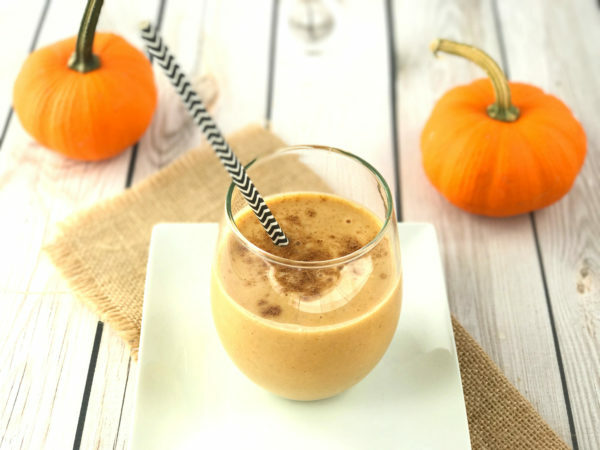 Feed your pumpkin craving with this snack size 100 calorie Pumpkin Pie Smoothie! Are you thrilled when fall rolls around and pumpkin starts to show up on store shelves in plentiful amounts? I am! I cook a lot with pumpkin because it’s incredibly nutritious, delicious and versatile. Right now I’m totally digging this Pumpkin Pie Smoothie. Smoothies are a fantastic breakfast, pre or post workout snack, or mid-afternoon pick me up. If you are not careful, the calories and sugar they contain can add up quickly, particularly when purchasing them at smoothie bars. This Pumpkin Pie Smoothie contributes only 100 calories to your day. The protein from the cottage cheese and the fiber from the pumpkin will help keep your hunger at bay. Plus, pumpkin is a fabulous source of many nutrients including Vitamins A and C, potassium, zinc, and fiber. This smoothie provides 160% of the recommended daily intake of Vitamin A. Tasty and great for you too! Plus, it’s gluten-free and vegetarian, and a great option for Meatless Monday. If you are really hungry, simply double the recipe for a meal-sized smoothie. Add all ingredients to a blender and blend until desired consistency is achieved. Dust with extra pumpkin pie spice or cinnamon as a garnish. Why do I love pumpkin?? Meanwhile, check out some of my favorite pumpkin recipes! This looks so good, I can’t wait to make it! Yay for cottage cheese in smoothies! I love the idea of a mini smoothie, especially pumpkin flavored-yum! I’ve been having Mango Ginger Cheesecake Smoothies this week for breakfast. I make them with cottage cheese and psyllium husk powder and they really fill me up 🙂 Have a wonderful weekend!